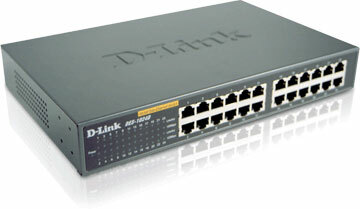 The D-Link DES-1024D 24-Port 10/100 Switch combines ease of use with unsurpassed performance, resulting in an exceptional value for any network administrator who wants the best possible solution at the best price. The DES-1024D is a true Plug-and-Play device, featuring Auto Speed Sensing, Auto-negotiation, and Auto MDI/MDI-X Crossover. Designed using industry standards, the DES-1024D is compatible with virtually all 10/100 Ethernet devices. It protects your existing network investments while providing you with a straightforward migration path for faster network speeds.